Former Real Madrid manager Zinedine Zidane has a number of options available to him for his next job, with Manchester United, Paris Saint-Germain and Juventus reportedly in the running for him. The French tactician was a big success with three Champions League title victories in less than three full seasons in charge at the Bernabeu, before he stepped down in the summer. CaughtOffside have since been told by sources close to Zidane that he’s spoken to United players about being confident of getting an offer to replace Jose Mourinho very soon. This comes as United have made a disappointing start to the season, but it seems there may be a key condition for Zidane to accept an offer to take over at Old Trafford. According to a stunning report from Diario Gol, the 46-year-old wants to be assured of being given the signing of PSG forward Neymar if he is to replace Mourinho in the United dugout. This would no doubt be an ambitious deal to pull off, but Diario Gol claims the Red Devils’ sponsors Chevrolet could perhaps get involved in helping deliver this superstar transfer. What a CV Zinedine Zidane has! Could Zinedine Zidane sign Neymar for Manchester United? 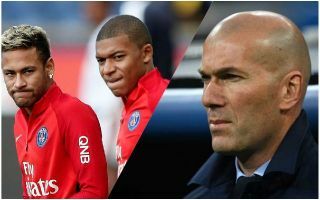 Zidane could also get the chance to coach Neymar at PSG, or to get a reunion with his former Real Madrid star Cristiano Ronaldo at Juventus. It’s little surprise to see the Frenchman in such high demand after his immense success at Real Madrid and his surprise availability following his decision to quit at the end of last season, which came rather out of the blue and will no doubt have been a blow to everyone involved with Los Blancos.